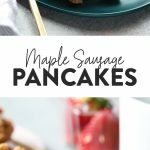 You can have your pancakes and your breakfast sausage at the same time with this Maple Breakfast Sausage Pancake Recipe. 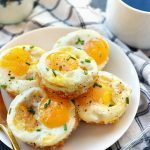 It is the perfect sweet and savory recipe for brunch on the weekends or a great meal-prep option for breakfast throughout the week. It’s Linley here and I don’t think there is a better way to start off the week, than with PANCAKES. 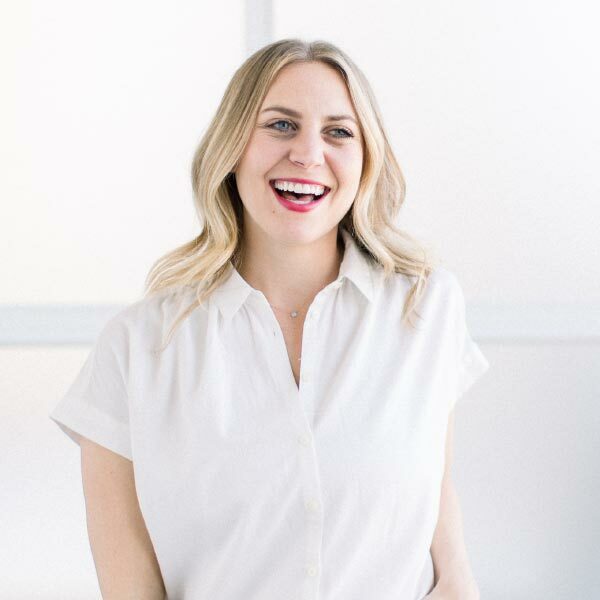 I know you’re probably all thinking ‘Linley, you’re a savory breakfast kind of a gal’. 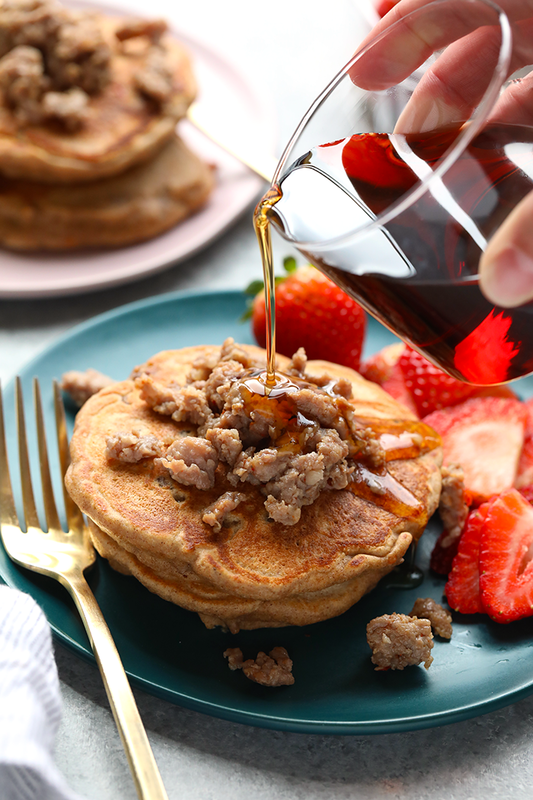 Well, you’re all right, but this breakfast sausage pancake recipe is the perfect combination of sweet and savory! 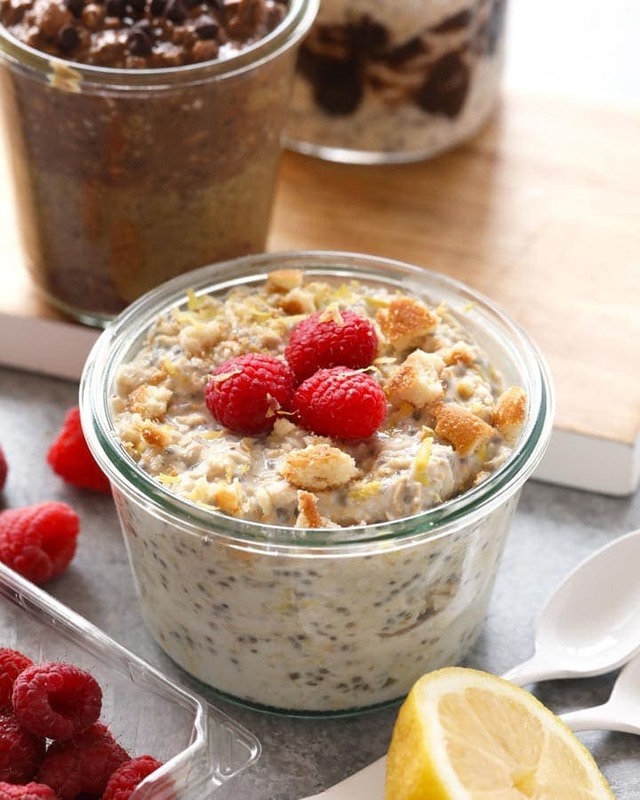 We developed this recipe at the River House, which is the best place to have breakfast or brunch. Why? You wake up to complete silence and walk out into nature and it’s a dream. If the weather’s nice, we drink coffee all morning which slowly transitions into making breakfast. 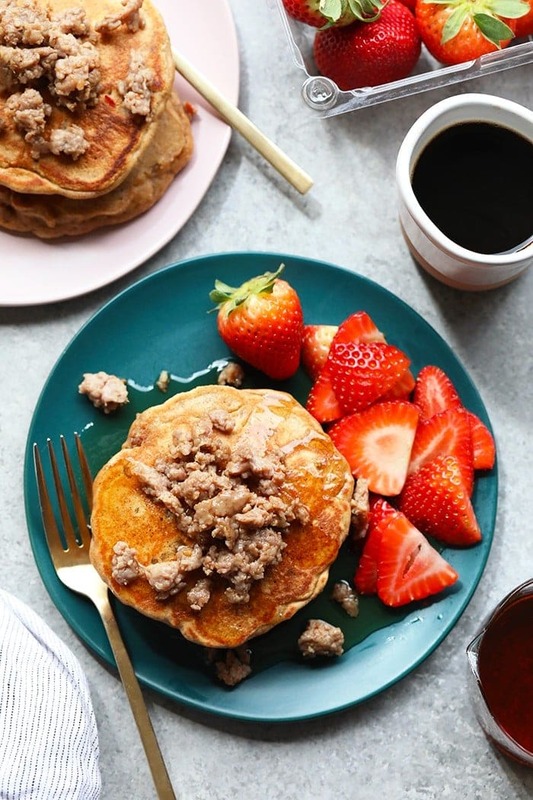 This breakfast sausage pancake recipe happened because we had a split of savory people and sweet people. 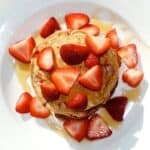 Why not throw a little bit of breakfast sausage protein into a sweet batter and top it with strawberries and maple syrup? People are always asking us how to make the perfect pancake. 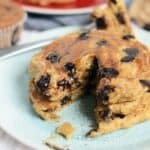 Every pancake batter is different, depending on what flour you use, whether they are vegan or have mix-ins like chocolate chips or raisins. 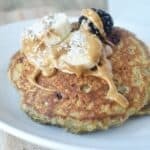 These this breakfast sausage pancake recipe takes a bit longer than some pancake recipe Some people like to use baking soda vs. baking powder, it just depends on whether you prefer fluffy pancakes or thin pancakes! 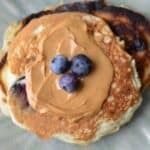 No matter what pancake batter you use, the first pancake is always a flop (meaning it will taste delicious and look terrible). We like to cook our pancakes on the stove top on medium/low heat. Patience is key, if your heat is too high you will burn the outside of your pancake and end up with an uncooked middle. When the uncooked side of your pancake starts to bubble, it’s time to flip! After you flip your flapjack wait 1-2 minutes and remove from heat! It takes some time to make the perfect pancakes, but being patient is the answer. 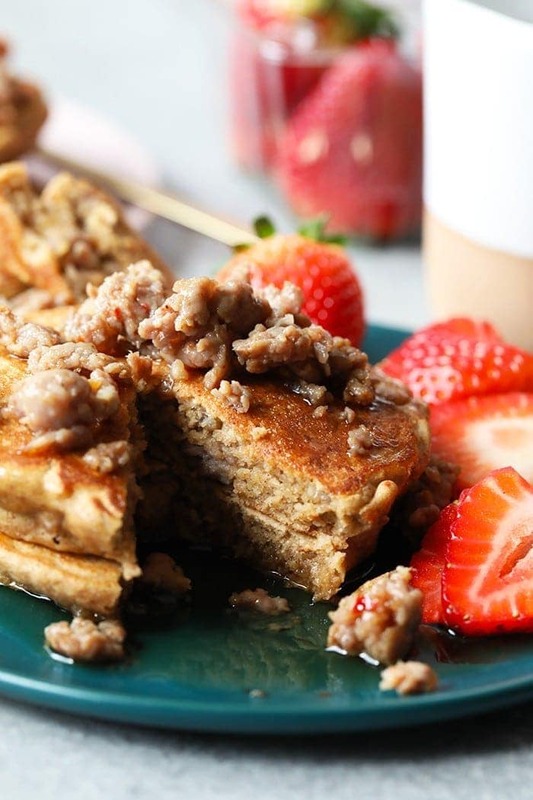 This Maple Breakfast Sausage Recipe is sure to kickstart any breakfast or brunch! 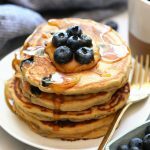 Give them a try today and let us know how YOU top your pancakes! First, heat a large skillet over medium/high heat. Add breakfast sausage to the pan and break up into small pieces. Cook fully and strain the pork in a colander or place it on a plate covered in paper towel. Both steps will soak up oil from the pork. Place pork in a bowl and set aside to cool. Next, place all dry ingredients in a separate bowl and mix well (hold off on adding the breakfast sausage). In a large mixing bowl, beat eggs and then add the rest of the wet ingredients to the bowl and mix until combined. Slowly add dry ingredient to wet ingredients. 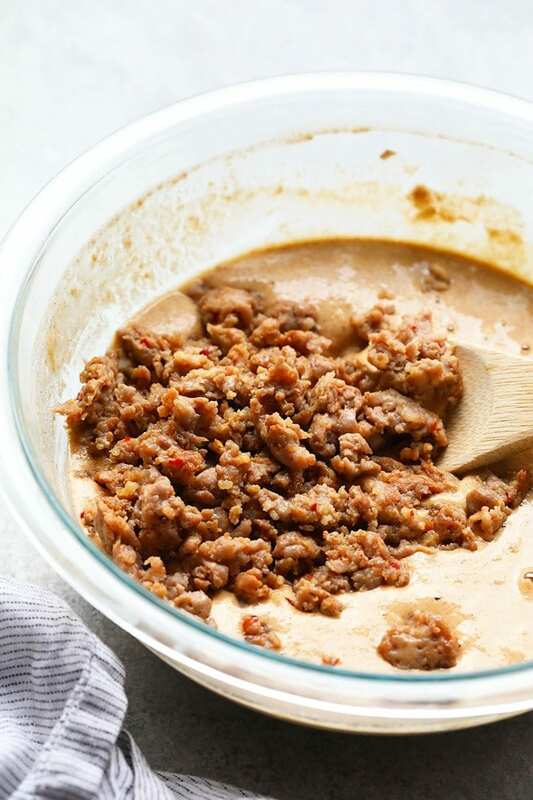 When pancake batter is combined, fold in ground breakfast sausage. Heat a large flat pan over medium/low heat and spray with coconut oil. Scoop a heaping 1/4 cup of pancake batter into the pan. Wait until the top of the batter starts to bubble and flip your flapjack. Cook for an additional 2 minutes and remove from heat. Repeat this process until the pancake batter is gone. Top with fruit of your choice and enjoy!